I know I said I would do this yesterday but the jetlag got the better of me and I fell asleep. I started my holiday reading with a proof of the new Jim Kelly - Death Wore White. It's not due for release until February 2009. It's a departure for him - a new series, not featuring Philip Dryden, instead it's about two police detectives: DI Shaw and DS Valentine. They're not a willing partnership. Valentine used to be Shaw's late father's partner and Shaw reckons he's past it, too old school to be of any use. Valentine on the other hand thinks his ex-partner's son is a college graduate who's out of his depth and has too high an opinion of himself. Anyway they're out checking on a body swept up on the shore when they get alerted to a queue of stranded cars in a snow drift near the beach where they're looking. But the driver of the first car is going nowhere - someone's put a chisel through his eye. It's a classic mystery setting - finite number of suspects, all or none of whom could have a motive, and the crime scene is rapidly metling away. It's sharply plotted and moves along well, but the best bit about this book is the relationship between the two detectives as they are forced to work together. I reckon this could turn into a great series - I can even see it on TV. Next I moved on to something a bit different - Cypress Grove by James Sallis. I was alerted to this series by a review in the bookseller a couple of weeks before I went on holiday. The third book in the series (Salt River) is due for publication in the UK in October. The review compared Sallis to James Lee Burke, so I was a little surprised that I'd never even heard of him. Never mind I thought when I go the the US I'll pick up the first couple and see what all the fuss is about. Easier said than done. None of his books are carried by Borders or Barnes & Noble. The bloke in Borders even told me there was no such writer. As you can imagine this just spurred me on even more to find his books. Eventually in a Brant's Books in Sarasota, there it was - the first one in the series. And what a treat it turned out to be. Set in rural Tennessee, with an ex-policeman as the protagonist. Turner is an ex-cop with a history - he's been in prison, he's been a psychotherapist, and now he's retired for a little of the quiet life in the backwoods halfway between Memphis and forever. Of course, events conspire to change all that and before he knows it Turner is helping local Sheriff Lonnie Bates with a brutal murder case. The narrative voice that Sallis uses in this book is wonderful. It's a rich Southern drawl that just oozes across the page. I think I'd like to listen to an audiobook of this - it reads like syrup. Now I need to track down the second in the series. I did manage to pick up several of his other books - he's also written a series about a black part-time detective part-time writer called Lew Griffin. They're set in New Orleans. More about them later as I did manage to read one. He also wrote a biography of Chester Himes - I need to look out for that one I think. A change of pace was called for so I picked up The Beekeeper's Apprentice by Laurie R King. I think I mentioned that this is out of print in the UK, but I'd never read it so I was pleased to find a secondhand copy. I'd avoided this series, as I think I've said in the past, because how can a Californian write about Sherlock Holmes? I admit that I was wrong. It's a lovely series, and now that I've read the first one and know how it all began, I can go on and read the rest of the series guilt-free. (I hate to read things out of order!). As I was on Laurie R King, my next read was The Art of Detection. This is a Kate Martinelli book, but it has links to Sherlock Holmes, as she's investigating the death of a renowned Sherlockian. I think I was hoping that she'd make more of the link between this and her Mary Russell books. There was the odd hint here and there but this book stuck by and large to the facts and skipped over the fictional stuff I was hoping might be there. It was enjoyable enough as it stood but I was hoping for more. What Was Lost by Catherine O'Flynn was the next book on my pile. I really wanted to like this, after all it's by a local lass, has won a couple of awards, was highly recommended to me..etc..etc. And all I could think was - is this it? Is that what all the fuss was about? It didn't really go anywhere - it was desperately in search of a plot and the ending was very weak. It's one redeeming part was the description of the Mystery Shopper - which should be read by all retail staff. 1974 by David Peace was another book I'd been meaning to read for a while, and Karen stepped forward at the right moment with a review copy. Now this of course is part of a quartet of books and I think it would be a little unfair to judge it entirely by itself but as a beginning I liked it. It's rough and in places it's a tad cliched. It's certainly not an easy read, brutal and unflinching in parts. I'm interested enough to want to read more and that's always a good sign. 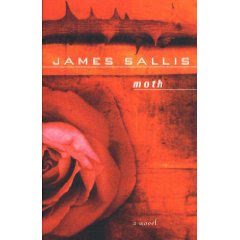 The final volume I managed to squeeze in was Moth by James Sallis. This is the second in his Lew Griffin series as mentioned above. I liked it. I liked the protagonist - he's a writer and lecturer and he does a bit of detecting (mostly finding people, on the evidence of this book), he's been an alcoholic and he's had a few ruined relationships. He's a black guy in Louisiana, a State that's still very racist and he has a wonderful turn of phrase. I've managed to pick up a couple of the others in this series and I'm looking forward to working through them. They seem to be out of print in the UK, don't seem to be easily available in the US either, but tracking down these books has always been part of the fun for me. My father-in-law started me on the Laurie King series when I was recovering from heart surgery in 1999 and it is series I have read over and over. He is now gone but I treasure the books that he gave me.